We're excited to announce NFI's InsideOut Dad® is now included in the Substance Abuse and Mental Health Services Administration’s (SAMHSA’s) National Registry of Evidence-based Programs and Practices (NREPP). This designation lends further credibility to the curriculum, the only evidence-based program designed specifically for incarcerated fathers. InsideOut Dad® was found to be evidence-based in 2011 as a result of an evaluation conducted by Rutgers University-Newark’s School of Public Affairs and Administration (SPAA), qualifying it as the first evidence-based program designed specifically for working with inmate fathers. Specifically, SPAA’s study compared the effects of the InsideOut Dad® program on more than 300 incarcerated fathers who participated in the program (intervention group) to incarcerated fathers who did not participate in it (control group). Through the quantitative data collected, the researchers found statistically significant changes across confidence, knowledge, behavior, and attitude variables in the intervention group compared to the control group. The researchers also conducted interviews with program facilitators. This qualitative data indicated that several of the practical issues that emerged in previous evaluations of other parenting programs for incarcerated parents did not become a problem, such as staff turnover, poor coordination, interruptions during class, a lack of respect, and comprehension difficulties. Based on the above findings of SPAA’s rigorous study, InsideOut Dad® then met NREPP's minimum requirements for review and has been independently assessed and rated for Quality of Research and Readiness for Dissemination, resulting in its listing on the registry. InsideOut Dad’s listing on the registry is an important iteration in a growing body of research that suggests that a key to reducing recidivism is ensuring that inmates have strong family connections. InsideOut Dad® is currently being used in over 400 correctional facilities across the country and has been named a standardized program by 26 state departments of corrections. It is also used by many community-based organizations as a re-entry or transitional program to help reintegrate ex-offenders back into their communities, often used in conjunction with NFI’s 24/7 Dad® program, job training programs, and other helpful interventions (e.g. substance abuse treatment). InsideOut Dad’s NREPP entry can be viewed here. 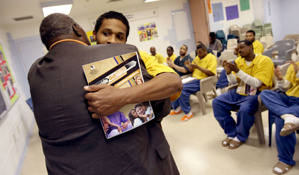 Prisons, jails, facilitators, and others can learn more about using InsideOut Dad® here. Photo credit: Daniel Sangjib Min/Richmond Times-Dispatch, 2013.